Arnica Oil prepared from the flowers of Heterotheca inuloides which is the species known for its anti-inflammatory and analgesic effect. Custom Wildcrafted especially for them in their native wild habitat, and are then made in small batches to retain freshness and therapeutic qualities. Maybe used as is as a massage oil, may further be diluted up to 50% with another cold pressed herbal oil like hemp seed oil. 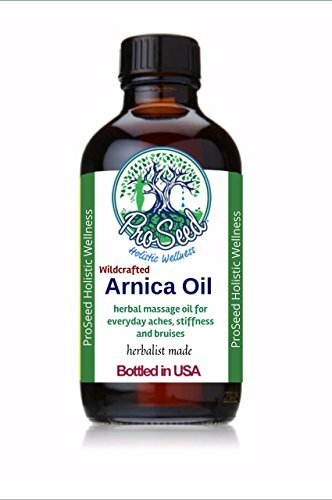 For those of you who are looking into making their own arnica salve this is the arnica oil they need to incorporate into salve. This version has the wintergreen essential oil added as wintergreen has naturally occurring salicylic acid that helps ease pain. Comes in 1 oz glass bottles. 2oz is listed seperately. FOR EXTERNAL USE ONLY Apply to skin with cotton gauze, or massage into skin until well absorbed. All orders are made in small batches and bottled per order. All essential oil blending is made personally by me, a NAHA certified Aromatherapist, and a Master Herbalist. All my products are organically grown or wildcrafted (pesticide-free/herbicide-free/no synthetic fertilizers or other chemicals) and Non GMO.